A Bat is a minor type of ghost enemy found in Luigi's Mansion. They come in two colors, purple and yellow, and often appear in large groups. Purple Bats are found hanging from the ceiling in hallways and staircases. When Luigi walks by them, they swoop down to attack him. If one hits Luigi, he sustains five HP of damage, and the ghost disappears in a puff of smoke. If the strike is unsuccessful, the Bat returns to the ceiling and prepares for the next attack. 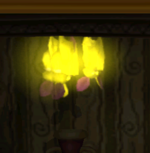 Yellow Bats also hang from ceilings, but only attack if Luigi wakes them up by turning on the Poltergust 3000 on vacuum mode (elemental mode does not work); however, they can also be awoken if Luigi is in first-person mode with the Game Boy Horror and the player presses the button. For them to attack, Luigi must be in the same room or corridor as they are. In all other respects, they are exactly the same as the purple Bats. Bats can be easily sucked up with the Poltergust 3000 or immediately destroyed with elemental powers. They bear a passing resemblance to Swoops, different bat enemies found in other Mario games. This page was last edited on February 14, 2019, at 08:34.